Cream puffs, my favorite dessert growing up... What's not to love? These bite size treats are light and airy yet rich and decadent, filled with whipped cream and dipped into chocolate. My Baba made these all the time for special occasions and, on request, when I needed to quench my sweet tooth. 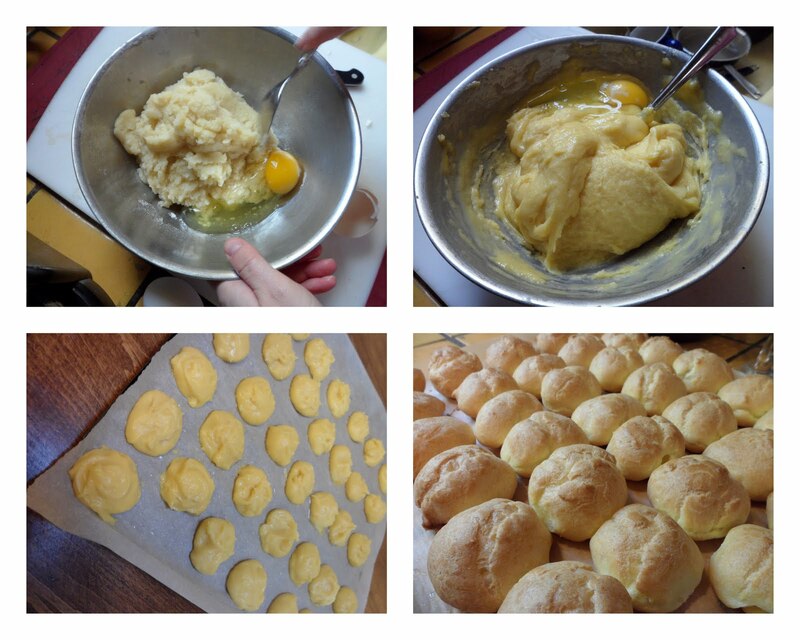 After eating countless cream puffs throughout my life, I figured it would be beneficial to learn the recipe from our family's master baker. So this Christmas Eve Baba and I had a baking class. Place a sheet of parchment paper onto a baking sheet and rub vegetable oil onto the parchment paper. Take the pate a choux dough and place it into a gallon-sized zip-lock bag and cut a 1/4 inch hole into one bottom corner to make a simple pastry bag. 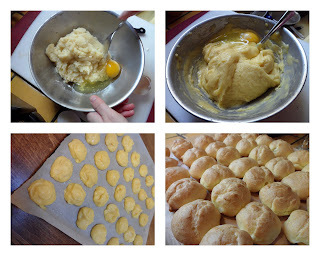 Squeeze out the dough onto the baking sheet to form individual puffs. My grandmother likes to use about a teaspoon of dough for each, but I prefer to make them bite-sized so I piped out about half a teaspoon each for my second batch. Bake the puffs in a preheated 400 degree oven until golden brown, for about 15-20 minutes, and then let them cool completely. When cool, cut the puffs in half so that there is a separate top and bottom. For the whipped cream filling, combine the heavy cream, vanilla, and sugar in a large bowl. Use a hand mixer, stand mixer, or whisk to whip the cream until thick, but not yet firm. You can prepare the whipped cream a couple of hours in advance, but use this helpful hint to to make sure it stays light and airy: Place the whipped cream into a strainer, place the strainer over a bowl, and then put everything into the refrigerator. Storing it this way allows any liquid that separates from the whipped cream to drain into the bowl. 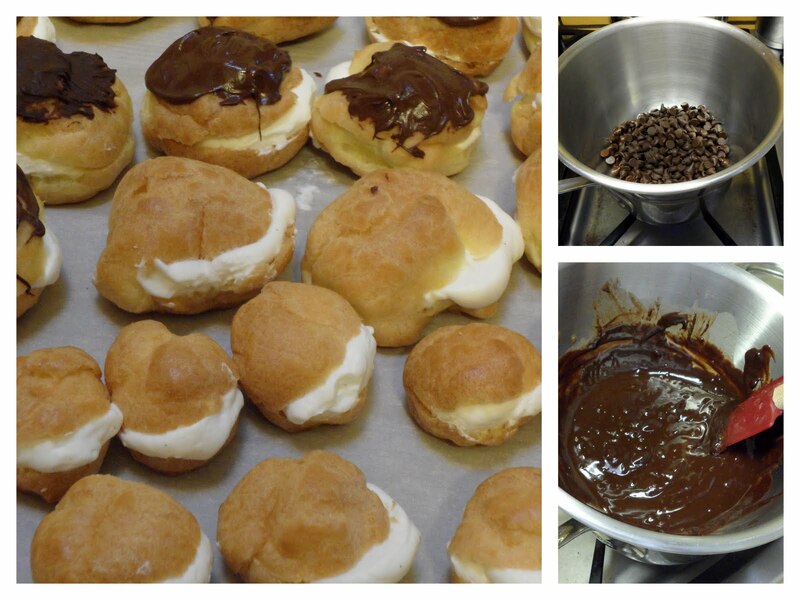 When you are ready to assemble the cream puffs, put the whipped cream into another ad-hoc zip-lock pastry bag (see above) and squeeze into the cream puffs. To melt the dark chocolate put it into a glass or stainless steel bowl and add 1/2 cup of heavy cream. Create a bain marie by placing the bowl of chocolate and cream over a pot filled with an inch of water boiling over medium heat, so that the bottom of the bowl doesn't touch the water. The bain marie allows you to use the indirect heat of the boiling water to slowly melt the chocolate in the bowl, which prevents the chocolate from seizing. When all the chocolate has melted, take it off the pot and dip each cream puff top into the chocolate or spoon the chocolate onto each cream puff. Set it aside and allow the chocolate to solidify. Merry Christmas and Seasons Eatings to All. Just a quick addition to the recipe. Sasha and I always make a huge batch, stuff them with whip cream and coat them in chocolate - the excess puffs get put into a zip lock bag into the freezer. When you want to eat them, take them out of the freezer and let them come to room temperature on the counter. Making these tasty bites available for a quick chocolate fix!